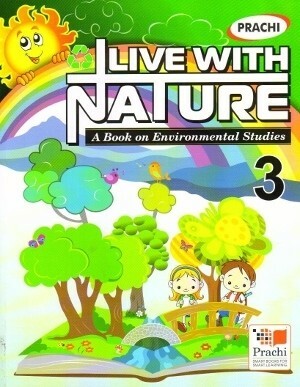 Prachi Live With Nature A Book on Environmental Studies Class 3 - Prachi Live with Nature is a series of six books from the primer to class V on Environmental Studies (EVS). The series is aimed to provide a complete study material on environmental studies for all the State Boards, CBSE and ICSE schools. Prachi Live with Nature is a series of six books from the primer to class V on Environmental Studies (EVS). The series is aimed to provide a complete study material on environmental studies for all the State Boards, CBSE and ICSE schools. The main objective to prepare the series is to make the learning of Environmental Studies interesting and joyful for the learners with ample opportunities for exploring the environment, to interact with it and to talk about it. All this has been done in a simple and child-friendly manner. The content is enriched with a simple language, colorful illustration and hands-on-activities. Each chapter is followed by exhaustive exercises that include multiple choice Questions (MCQs), True/False, fill In the blanks, word puzzles, Activities etc. Brain Sharpening Questions (BSQs), and Life Skills are provided to boost creative, perceptive and analytical skills. Fact File given at the end of chapters carries valuable information. Things to Remember at the end of each chapter, provides a quick revision of the chapter.